1) The wedge holding block, being firmly attached to the strut, provides the means for holding the corresponding wedge that makes up the forward part of the stationary cutter. 2) When a line is caught between the stationary cutting blade and the rotating cutting blade (attached to shall), the wedge forces the two blades tightly together, overcoming the resistance of the bearing and instantly cuts the line. Normally the stationary and rotating blades never touch; they are held apart by the teflon bearing which purposely isolates the metals from wear. 3) At the instant of cut, the blades come closer together. 1) The wedge holding block is mounted onto the the stem bearing tube or strut and held by stainless steel screws (provided with cutter). Holes are to be drilled and tapped to receive these screws. Holding block is to be used as a template in place when all but first screw is drilled and tapped. 2) The wedge holding block is to be mounted on the same side of the strut as the rotation of the propeller. 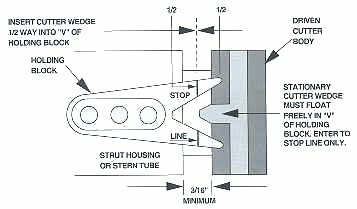 EXAMPLE: If there is a right-hand prop, the holding block would be mounted on the starboard side of the strut; on a left-hand prop, it would be mounted on the portside of the strut. 3) Holding block must be positioned to accommodate the stationary cutter wedge, with the stationary cutter wedge entering only one-half way into the V of the holding block. This is important to assure enough clearance to move with shaft and avoid bottoming in holding block V. If the male wedge of the stationary cutter touches the bottom of the female wedge holding block during forward end play, this will force the cutter blades together grinding metal on metal, causing the blades to be destroyed through excess friction.